daze of tundra: Just back from holiday. iant fun. I finished totally buzzing and needed a few glasses of Cointreau and lime (classy Jez...) before I was ready for bed. Sometimes I miss racing but this 24/12 was the best ever for me. Great course, great people, great food. Next on the list was a rather impromptu silly ride. 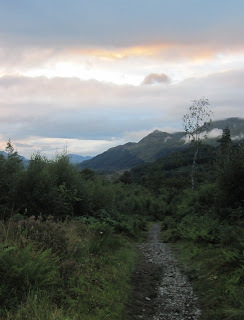 I had a bash at riding the West Highland Way double. Idle hands had me scratching around for something to do, after a very helpful chat with Rob Lee I set a date, 10 days later, to have a bash. There’s been a lot of chat about this challenge but it remains un-ridden. My legs were feeling good and now seemed as good a time as any. I had a bit of a mad panic getting my bike sorted and collecting kit but everything came together. The plan was to leave Milngavie early evening so I would get the harder direction out of the way first, but also the most technical sections I would be ridden in the light. I set of just after 6pm travelling very light. I made very quick progress through the early miles. Even, the notoriously tough, climb over Conic hill was out of the way quickly and I loved the descent- the Top Fuel got me out of trouble just as quickly as it got in to it! By the time I got to Ptarmigan lodge I had to fire up the Six Pack but I was still feeling strong. By now it was drizzling pretty heavily, so I stopped briefly to put on some waterproof trousers and my ace new Gore Alp-X jacket. The feared portage section along Loch Lomond side was better that I had feared but by the time I reached Rob Roys cave the weather was decidedly bad. The trail was very slimy under foot (or tyre?) and it was really slowing my progress. And that’s not to mention the stiff headwind. At this stage I had a rare thought about my safety. I was carrying some extra warm clothing and a survival bag but to keep it light I didn’t have a sleeping bag or bivy. As I rode past a candle lit bothy I almost stopped rather than risk the exposure on the desolate later sections. I reassured myself that I was still feeling fresh so opted to push on. Push being the operative word. Frustratingly the surface was really limiting the amount I could ride. The trail undulates quite a lot and I’m sure in better weather I’m sure I could have made much better progress. As it stood, it just seemed to be ruining my legs. At about 3 am I passed some guys drunk at a camp fire we looked at each other with confusion but I carried on, resisting the temptation to stop for a beer. On the descent towards Kingshouse (I think, it’s a bit of a blur...) things took a turn for the worse. Visibility had been low for quite a while but as the trail pointed down cloud seemed to lift. As I railed a fast left hander a sheep threw itself in front of my bike. I couldn’t quite believe it was happening, for some time I had been shouting or singing to scatter sheep, but this one actually turned around and ran in to my path. I glanced of its hind legs and cart wheeled over the bars throwing my bike of the trail. My bike and I landed in the predictable piles of pointy rocks, the sheep hardly broke step. By the time I had picked myself up I was already engulfed in a swarm of midges. The bike was in a pretty bad way; ripped sidewall, bent rotor, front mech spun around the seat tube, stem at a rakish angle and a smashed end to my carbon bars... I straightened out as much as I could and popped an anchovy in the front tyre all the time not to inhale the midges. The whole thing seemed ridiculous. Thankfully it didn’t take me too long to get going again and by now the sun was coming up, which is always a nice psychological boost. Another puncture slowed me down a little but I was really enjoying my own company and having fun on the trail. The Devils Staircase was slow going but the following downhill was very entertaining, gusts of wind came from nowhere as I tried to make it down fast and in one piece. Unfortunately, by now the weather was really closing in again and this time my legs were really starting to suffer. As I climbed out of Kinlochleven I got the sinking feeling that I wouldn't be getting back here today. The ride in to Fort William was really fun despite it all but I spent the whole time soul searching. Was I giving in too easily? I came to the conclusion that it was going to be dangerous to drag myself back out in to the hills in this condition, in this weather. Packing early is always a hard decision, but as I sit here typing, nearly 3 weeks later, my knees are being iced as I try to get them back in to working order. I know it was the right decision. A lot of forum chat has been really negative about this route but I enjoyed it. While I'm sure it isn't the best point to point (to point) route Scotland has to offer, it is a great yard stick. I'd like to have another crack at the double at some point. Watch this space. Kamikazi sheep to contend with also... Riding support on a WHW double effort later today. Will def remember the shouting and singing to hopefully ward them off!